Electricity is one of the major man-made sources of energy, with the help of which everything, in fact the whole world runs. Just take a look at your own surroundings, irrespective of where you are, and make count of the number of electrical items around you which are consuming electric energy, both properly and also improperly. Yes, you might be a little astonished by the fact, that if a single individual is using so many electrical items, what must be the amount of electricity consumed each and every day by people of whole nation, considering people from each and every social class. On the other side of the coin, have you ever wondered why the power cuts, particularly these days, are increasing more and more? Well the reason for this is the power sector India, which is being unable to provide enough electricity to meet the needs of the nation. 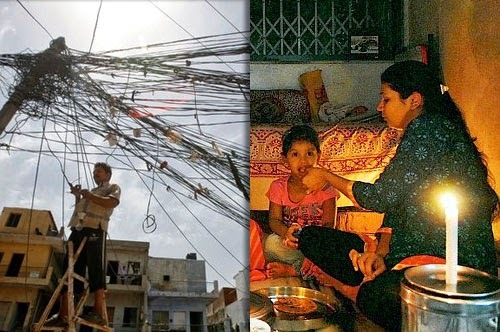 We cannot simply blame the power sector and government for this. In fact the main and major reason behind this power cuts are the people of the nation themselves. So, here we move forward with this briefing and slowly into the actual reasons, causes and solutions. The current scenario of the electricity shortage in India can mainly be blamed on the excess demand and lesser supply gap. Indian power sector is facing challenges and despite significant growth in generation over the years, it has been suffering from shortages and supply facilities. Energy at final or peak load shortages were 7.8 % and 13 % respectively in the year 2000-01. The per capita electricity consumption in India is about 400 kWh/year, which is significantly lower than the world average of 2,100 kWh per year. As GDP growth induces to an ambitious 8 to 10 %, the shortage of power will become more severe. Central Electricity Authority (CEA) has initially projected a shortfall of 1,50,000 MW in 15 years. Hence, a capacity addition target of 10,000 MW every year. The actual capacity addition has been falling far behind the established targets. The CEA has recently revised the capacity incrementing the target to a 1,00,000 MW from the previous target. This directs an annual addition of 8,500 MW as against previously fixed amount of 10,000 MW. Capacity addition that has been provided adhesively in the last five years, also including financial year 2000 was about the average amount of 3,000 MW per year. Of the total capacity that has been added during last five years, 49% was added by the states and balance by central plants. India has drastically failed to meet its power sector targets by a considerably high margin and with tremendous number of opportunities that are actually going to come in future. The power sector continues to be affected a lot by the downfall on both generation as well as the transmission side of this particular phase. For instance, met us consider the current installed capacity of about 152 GW. The inter- regional capacity for transmission is only about 20 GW (13 percent of the installed capacity). The major barriers and bottlenecks for the growing electricity problem is India are high captive investment and low commercial viability. Lack of absolute capital at affordable low costs, limited access to financial resources and high cost of finance, lack of awareness. Some of the examples for this lack of awareness can be said to be bagasse is available with farmers with no exposure of power sector economics. Lack of large scale production facilities is also one of the major issues that results in the electricity problems. India will surely look into inducing and resolving the supply deficit of power to resolve the same but looking at the past record, it can be estimated that the resolution measures may or may not be implemented. Renewable energy technologies based on the inexhaustible resources like, of the sun, wind, water and even biomass are said to offer sustainable energy alternatives to a world beset by serious environmental problems and volatile fossil fuel politics. An increasing share of global energy needs is expected to be met by renewable in the years ahead. Around 3000 MW (3 % of total installed capacity) capacity of Renewable Energy (RE) projects have been installed in the country. India is planning to increase the levels to 12,000 MW, capacity of power generating from renewable by the end of 11th plan (2011-2012). Almost half of it is expected to come from wind, 3,500 MW from biomass and 2,000 MW from small hydro. The Potential of Sugar Cogeneration in India can also prove to be an effective solution where Cogen power plants at sugar mills in India are getting stabilized and commercialized with pressure and temperature configurations up to 87 kg/ cm2 and 5100C. Also equipment and man-power shortage are one of the facts that need to be taken care of by the government. Schedule dependency on transmission line and also predicting and implementing the right balanced value of demand-supply forecast, might as well play a major role in controlling this electricity problem in India.